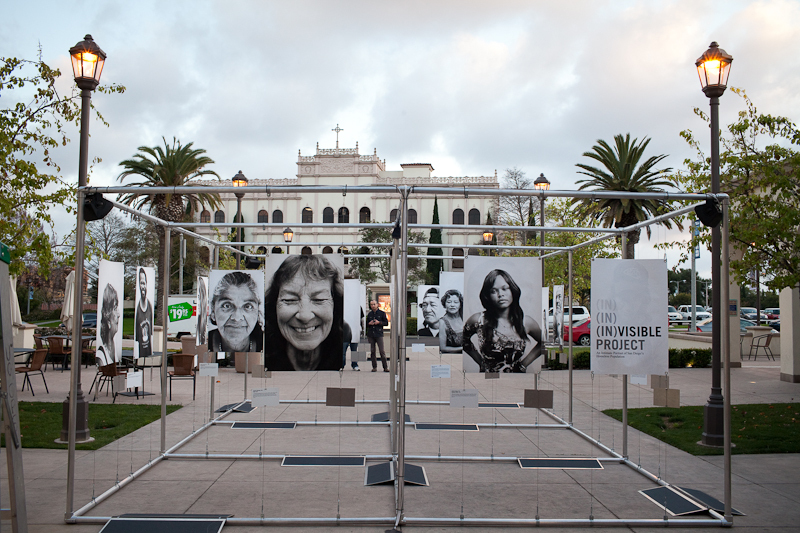 The (In)Visible Project installation is currently on view at the University of San Diego from Feb. 12-26. Please feel free to stop by and check it out (no admission) in the Plaza Menor, between the University Center and Student Life Pavilion. USD’s Center for Inclusion and Diversity will also be sponsoring a forum on homelessness in the San Diego community, from 7-8:30pm on Thursday, February 23 in the Joan B. Kroc Institute for Peace and Justice Theater. The discussion will be moderated by USD Sociology Professor, Dr. JJ Schlictman, and the panelists include Jennifer Litwak, manager of projects and development for the San Diego Regional Task Force on the Homeless; Matthew Doherty, principal of Housing Policy and Planning at LeSar Development Consultants; Rick Gentry, president and CEO of the San Diego Housing Commission; Patricia Leslie, facilitator of the Regional Continuum of Care Council; Brian Maienschein, commissioner of the Plan to End Chronic Homelessness at the United Way of San Diego; Teresa Smith, director and co-founder of Dreams for Change, a local homeless advocacy group; and Simone Ruff, San Diego director of the Corporation for Supportive Housing. For more info, and for a link to RSVP for the free event, click here.